The vertical drop from summit to base is 1581 ft. 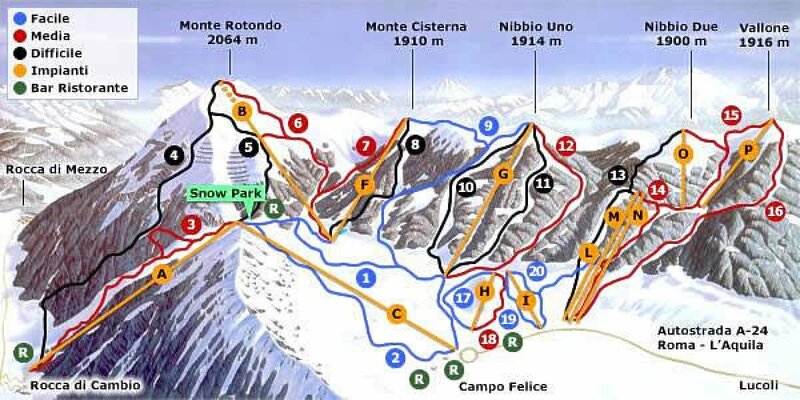 The average difference in altitude between base and summit of Ski Resorts in Italy is 3087 ft. Runs and slopes are therefore relatively short. The high point of the ski resort is located at an elevation of 6286 ft.
Rocca di Cambio is among the 3 best rated Ski Resorts in Abruzzo. Season starts on Dec 21 and ends on Apr 7 (107 days). Average season duration in Italy is 130 days. The ski resort is among the 3 ski Resorts with best conditions in Abruzzo. Rocca di Cambio features 64 sunny days on average per season. The average for all ski Resorts in Italy is 70 sunny days. March is the sunniest month with an average of 24 sunny days. Offering 18 miles of slopes and terrain, Rocca di Cambio is among the 3 largest Ski Resorts in Abruzzo. Campo Felice is situated in a region surrounded by a mountain range of about 2000 meters height. Thus the snow conditions in this ski resort are known to be excellent throughout the season. If by chance there isn´t enough snow for skiing, the modern snow cannons fill in to guarantee unrestricted skiing fun. The resort´s lift facilities provide a capacity of 18,000 persons per hour. That´s why there aren´t any or only low waiting times for the skiers. The slopes are for all kinds of skills. Advanced skiers will have the most opportunities, as a bigger part are red slopes. Skiing freshmen, who´ve never tried skiing before, can take their first steps on the green slopes. There they´ll find magic carpets, especially designed for skiers without experience. Freeskiers and snowboarders are mostly found in the resort´s fun park, where they try out cool moves and chill out with their fellow freestylers. And for the hungry and tired vacationers there are plenty of lodges and mountain restaurants to relax and to appease one´s hunger.